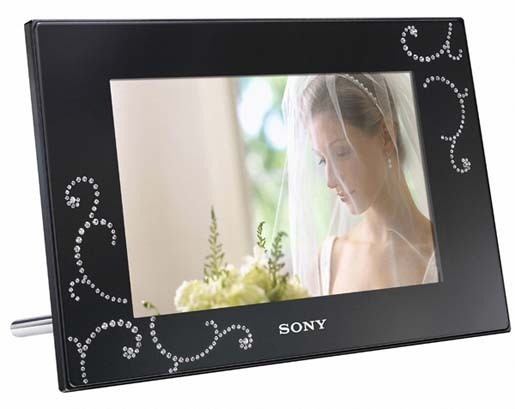 Sony Launches 3 New Photo Frames In Japan ! Three latest model Photo Frames, the DPF-D92 at 9”, the DPF-D72 Series at 7” and the last one the DPP-F700 at 7” are introduced by Sony in Japan. With the first two models the DPF-D92 and the DPF-D72 series you can have the specification with 1GB of internal memory, WVGA Monitor, Support of JPEG, RAM as well as TIFF and BMP (on the model D72). Moreover, this model D72 is available with a Swarovski tuned bezel. The last model DPP-F700 is a little bit different than other models as it features a 7” LCD monitor with a WQVGA resolution, 128MB of internal memory and a compact printer. The other common features included are Calendars, Slideshow and rotation mode that can be found in the other two models.